Worn Patio Furniture: Repair or Replace? The arrival of summer weather has many homeowners uncovering and pulling out their patio furniture that has been stored all winter. The patio furniture may need to be cleaned as a result of the winter storage and if you notice some rusting or disrepair to the fabric, your patio furniture can more than likely be repaired which would save you much more money than replacing the furniture. The following are some tips for furniture repair that you can do yourself or if you do not feel comfortable repairing your own furniture, you can contact a professional that specializes in patio furniture repair. Sling Fabric Chairs: Patio chairs that are made of sling fabric can become faded, torn, or dirty, but replacing the fabric sling is much more cost effective than replacing the whole chair. 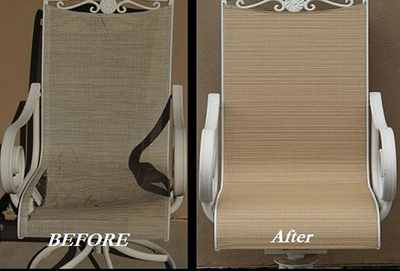 Sling fabric can be replaced for about $60-75 dollars per chair compared to the $150 plus to replace a sling chair. The other advantage of replacing the sling fabric is that you have a choice of any style or color fabric you want for your chairs. New fabric slings are also easy to install yourself. Strap Chairs: Strap patio chairs consist of vinyl straps making up their backing that can become worn or broken over time. Replacing a vinyl strap chair can be quite expensive at about $200 per chair but replacing the straps themselves can be done much cheaper with replacement straps costing between $2-5 each. It is possible to replace the vinyl straps yourself with the proper measurements and the right tools. Outdoor Fabric Care: When cleaning the fabric on your patio furniture, it is best to avoid using harsh cleaners like bleach and instead use mild dish soap. Iron Furniture: Furniture made of iron can get pretty dirty or a little rusty but buffing the frame with a car wax for a few minutes can remove the dirt and rust. Materials that Do Not Rust or Fade: There are materials other than iron that can be used on patio furniture that do not rust or fade. These materials include coated plastic and titanium that will not get blown around by the wind and heavier aluminums that do not rust as quickly as iron. The other advantage of these materials is that they can be left outside during the winter. As you uncover and clean up your patio furniture for the summer, inspect the furniture to see if it has any parts that need to be repaired or replaced. Repairing worn out furniture is much more cost effective than replacing it with new furniture and it can achieve the same effect as having new furniture.